Erie County Clerk Christopher Jacobs and Paul Kolkmeyer have purchased the former Birzon building at 686 Main St.
Erie County Clerk Christopher Jacobs, a downtown real estate developer before getting into politics, is teaming up with a neighboring building owner and another developer to tackle a new project in downtown Buffalo. 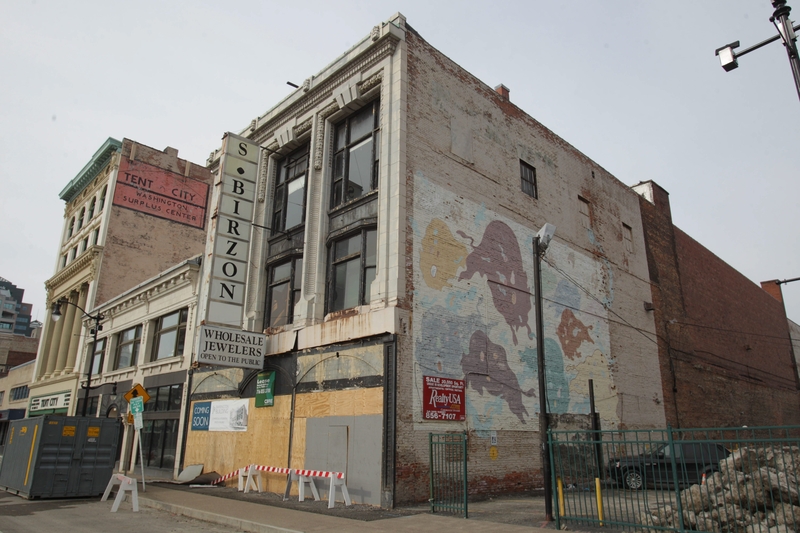 Jacobs, who owns 678 Main St., will join with banker-turned-developer Paul Kolkmeyer as minority investors in the $5 million effort to convert the former Birzon building at 686 Main St. into a mixture of retail, office and residential space. The 30,000-square-foot building, which extends from Main to Pearl Street, is owned by John Barry, who has been trying for some time to pull together a renovation project but lacked key tenants to fill the space. Jacobs, who owns the building next door, has a fast-growing tenant on his second floor – educational technology company 3rd Learning Systems – that needs 5,000 square feet of additional space. “They’ve grown so significantly,” Jacobs said. So Jacobs devised a proposal to help both his tenant and Barry, and brought Kolkmeyer in to join him in financing and managing the project. Barry already has a grant from the New York Main Street program administered by Buffalo Place, and would also seek historic tax credits for the renovation. Jacobs is on the Buffalo Place board, which voted Wednesday to acknowledge Jacobs’ interest in the project and waive any conflict of interest objections over the previously awarded grant through the Main Street program. Plans call for the trio to “punch a hole” between the two buildings to link the second floors, giving 3rd Learning a seamless expansion and making it the anchor tenant in Barry’s building. The goal is to put a retail store or restaurant on the first floor, while taking up the third floor with 12 loft-style apartments, mostly one-bedroom units with some two-bedroom units. However, the effort could still fall through. For one thing, the New York Main Street grant, which Barry obtained two years ago, must be used up within the next few months, which may not be enough time. And the concept hinges on the trio’s ability to cut windows along the entire wall on the other side of 686 Main. But that faces a parking lot owned by restaurateur and developer Mark Croce, whose permission for a variance or easement is required for the work because the property line is right up against the building, and Croce could put up his own building there if he chose. “We are working together to find a way to make this happen. I expect that we will reach an amicable solution,” Croce said.